Dedication to Heracles Callinicus for the well-being of the governor (or commander) of the Upper Satrapies, Cleomenes. Mt. Bīsotūn, Kermānšāh province, Iran. 148 BC. Excavations of A. Hakemi (Iranian Center for Archaeological Research, ICHTO), 1960. H. 1.90 m (inscribed stele: H. 0.46 m, W. 0.34 m). In the year 164, in the month of Panemus, Hyacinthus, the son of Pantauchus, (dedicated) Heracles Callinicus for the well-being of Cleomenes, the governor (or commander) of the Upper Satrapies. Ancient Greek text after Rougemont, G. 2012. Inscriptions grecques d'Iran et d'Asie centrale, avec des contributions de Paul Bernard. Corpus Inscriptionum Iranicarum, part II, vol. I.1. London: no. 70. Reproduced by permission of Georges Rougemont and the Corpus Inscriptionum Iranicarum. Aramaic text after Bivar, A. D. H. 1978. 'The Aramaic summary.' In Stronach, D., Pasargadae. A Report on the Excavations Conducted by the British Institute of Persian Studies from 1961 to 1963. Oxford: 161. The monument is carved at the base of the southwestern slope of Mt. Bīsotūn. It was exposed during the repair of the Baghdad-Tehrān highway (Ḥākemī 1338/1959-1960). In antiquity, it would have stood by the main thoroughfare leading from Mesopotamia to Ecbatana. It is important both on account of its dated Greek inscription and as an example of Seleucid monumental art in Iran. The inscription, first illustrated and discussed in the initial publication of the monument by ʿAlī Ḥākemī, was also made known from a copy owed to Daniel Schlumberger (Robert 1963: 76; subsequent editions: Canali De Rossi 2004: no. 274; Merkelbach and Stauber 2005: no. 308; Rougemont 2012: no. 70). Its Seleucid date, corresponding to 148 BC, places the dedication at a moment of transition from Seleucid to Parthian political supremacy in Iranian territory. The names are all Greek, and the dedicant's patronymic, Pantauchus, points to Macedonian onomastics (e.g., Masson 1984: 134). An eloquent testimony for a Greek presence (and possibly settlement? ; see also Cohen 2013: 204) in the Bīsotūn area in the mid-second century BC, this Greek dedication to a Greek hero variously points, simultaneously, to interaction between the Greek and the Iranian tradition. 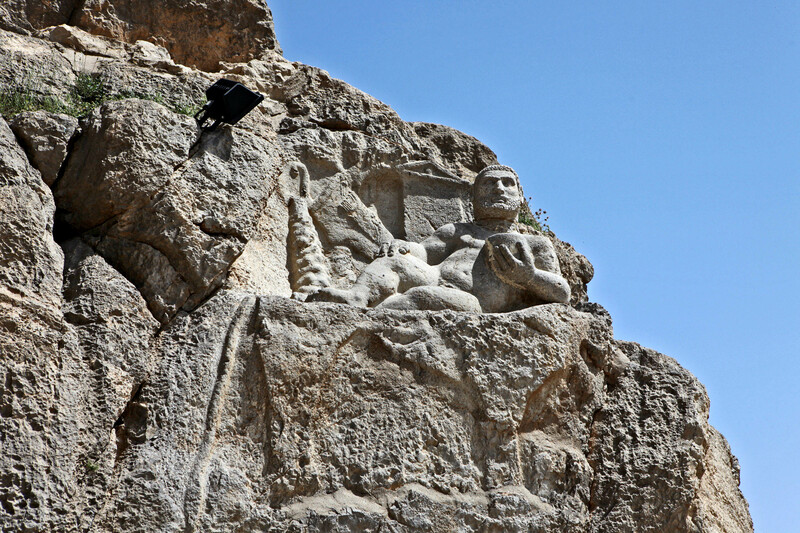 Heracles' Greek iconography materializes in the medium of a rock-cut monument that was typically Iranian (also Callieri 2007: 212). The title, 'satrap', of Cleomenes as a governor or commander of the 'Upper Satrapies' ('Upper Provinces', i.e., the sum of the provinces to the east of Mesopotamia [or the Halys River?]) testifies to the perpetuation of Achaemenid Persian administrative/military terminology under the Seleucid regime ('satrap' [OPers. xšaçapāvan, lit. 'protector of the realm']: Kent 1953: DB III 14 and 56, cf. Schmitt 1976: 373; 'satrapy' [Gk. σατραπηίη]: Hdt. 3.89.1). Assuming that the proposed identification of Mt. Bīsotūn with Tacitus' (Ann. 12.13) Mt. Sanbulos is correct (Sarre and Herzfeld 1910: 190 n. 2; Herzfeld 1920: 46; Bernard 1980; Boyce and Grenet 1991: 93), the monument would have stood within the precinct of an Iranian sanctuary, which, interestingly enough, was perceived in Tacitus' era (first/second century AD) mainly as a place of worship of Heracles. The latter author's implication that Heracles was worshipped at Mt. Sanbulos as, among other things, a 'horseman' could allude to an assimilation of the Greek hero to a local rider god (cf. Bernard 1980: 321-323; Boyce and Grenet 1991: 93-94). An additional manifestation of a dialogue between the Greek and Iranian worldviews could be provided by traces of a possible parallel version in Aramaic, the bureaucratic language and lingua franca of the Achaemenid realm, that were discerned below the Greek inscription (Bivar 1978: 161; cf. Huyse 1996: 66). Bernard, P. 1980. 'Héraclès, les grottes de Karafto et le sanctuaire du Mont Samboulos en Iran.' Studia iranica 9: 301-324. Bonanno Aravantinos, M. 1991. 'Osservazioni sul tipo dell'Eracle sdraiato.' In Stucchi, S. and Bonanno Aravantinos, M. (eds. ), Giornate di studio in onore di Achille Adriani, Roma, 26-27 novembre 1984. Studi miscellanei 28. Rome: 155-179. Callieri, P. and Askari Chaverdi, A. 2013. 'Media, Khuzestan, and Fars between the end of the Achaemenids and the rise of the Sasanians.' In Potts. D. T. (ed. ), The Oxford Handbook of Ancient Iran. Oxford: 690-717. Ḥākemī, ʿA. [Hakemi, A.] 1338/1959-1960. ‘Mojassama-ye Herkūl dar Bīsotūn’ [‘Statue of Heracles at Bīsotūn’]. Majalle-ye bāstānšenāsi 3-4: 3-12. Huff, D. 1984. 'Das Felsrelief von Qir (Fars).' Archäologische Mitteilungen aus Iran 17: 221–247. Huyse, Ph. 1996. 'Die Rolle des Griechischen im "hellenistischen" Iran.' In Funck, B. (ed. ), Hellenismus: Beiträge zur Erforschung von Akkulturation und politischer Ordnung in den Staaten des hellenistischen Zeitalters, Akten des Internationalen Hellenismus-Kolloquiums 9.-14. März 1994 in Berlin. Tübingen: 57-76. Kawami, T. S. 1987. Monumental Art of the Parthian Period in Iran. Acta Iranica 26. Leiden. Kleiss, W. 1970. 'Zur Topographie des “Partherhanges” in Bisutun.' Archäologische Mitteilungen aus Iran n.s. 3: 133-168. Kosmin, P. J. 2013. 'Alexander the Great and the Seleucids in Iran.' In Potts, D. T. (ed. ), The Oxford Handbook of Ancient Iran. Oxford: 671-689. Luschey, H. 1965. 'Ausgrabungen in Bisutun’ [in German and Persian]. Anjoman-e Farhang-e Īrān-e Bāstān [Ancient Iranian Cultural Society], Bulletin 2/1: 19-41. ——. 1974. 'Bisutun, Geschichte und Forschungsgeschichte.' Archäologischer Anzeiger 89: 114-149. ——. 1996. 'Die seleukidische Heraklesfigur.’ In Kleiss, W. and Calmeyer, P. (eds. ), Bisutun: Ausgrabungen und Forschungen in den Jahren 1963-1967. Teheraner Forschungen VII. Berlin: 59-60. Masson, O. 1984. 'Quelques noms de femmes en Macédoine.' Zeitschrift für Papyrologie und Epigraphik 55: 133-136. Robert, L. 1963. 'Review of Samothrace II.1.' Gnomon 35: 50-79. Schmitt, R. 1976. 'Der Titel “Satrap”.’ In Morpurgo, A. and Meid, W. (eds. ), Studies in Greek, Italic and Indo-European Linguistics: Offered to Leonard R. Palmer on the Occasion of his Seventieth Birthday, June 5, 1976. Innsbrucker Beiträge zur Sprachwissenschaft 16. Innsbruck: 373-390. Vanden Berghe, L. 1983. Reliefs rupestres de l’Iran ancien. Brussels.